Houghton Mifflin Harcourt, 9780151012787, 336pp. "I absolutely loved Newton and the Counterfeiter. Deft, witty and exhaustively researched, Levenson's tale illuminates a near-forgotten chapter of Newton's extraordinary life--the cat-and-mouse game that pitted him against a criminal mastermind--and manages not only to add to our knowledge of the great mathematician but to make a page turner out of it. This book rocks." "I loved Levenson's book. It's a rollicking account of the fascinating underbelly of seventeenth-century London--and reveals an aspect of Newton I'd scarcely known of before, yet which shaped the world we know. A tour de force." "Levenson''s account of this world of criminality, collusion and denunciation is meticulously researched and highly readable...the tale of Newton the economist is one worth telling." "Newton and the Counterfeiter packs a wonderful punch in its thoroughly surprising revelation of that other Isaac Newton, and in its vivid re-creation of 17th-century London and its fascinating criminal haunts." "Newton and the Counterfeiter is as finely struck as one of Newton''s shillings." 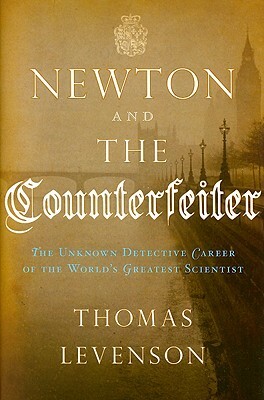 "Levenson transforms inflation and metallurgy into a suspenseful detective story bolstered by an eloquent summary of Newtonian physics and stomach-turning descriptions of prison life in the Tower of London...Newton and the Counterfeiter humanizes a legend, transforming him into a Sherlock Holmes in pursuit of his own private Moriarity."